It's rare for Sonia to be lazier than I am. That's why it kind of surprised me when the first comment she made about this pie was "You know, Trader Joe's has got to start pre-slicing their pies." Now there's a first-world problem if I ever heard one: that moment when you realize you will have to cut your own slice of chocolate pecan pudding pie. But cut a slice she did—actually, one for herself and one for me—although, I would have been more than willing to cut mine myself. Because I've been looking forward to trying this delectable dessert since I first heard about it a week or two ago on Instagram and Spotted on Shelves. It has a "this will be your dessert on Thanksgiving Day" kind of vibe about it: the name, the packaging, the $7 price tag. And there's another horrific first-world problem for you: that moment when you realize you'll have to eat your Thanksgiving dessert a month early because you're an intrepid foodie-hack blogger. Inquiring minds want to know and all. So I'm here to tell you that if you like chocolate, pie crust, and pecans...GO AHEAD AND BUY THIS FOR YOUR FAMILY'S THANKSGIVING DESSERT. I am not working for Trader Joe's. I am not making any commission off of this recommendation. I'm telling you this because you'll thank me. And even if you're one of those rare people that's somehow not in love at first bite with this scrumptious snack, I can pretty much guarantee someone in your family will enjoy this product. My dear misguided wife was one of those rare people not in love with this pie. "It's too rich," she said upon her first taste. 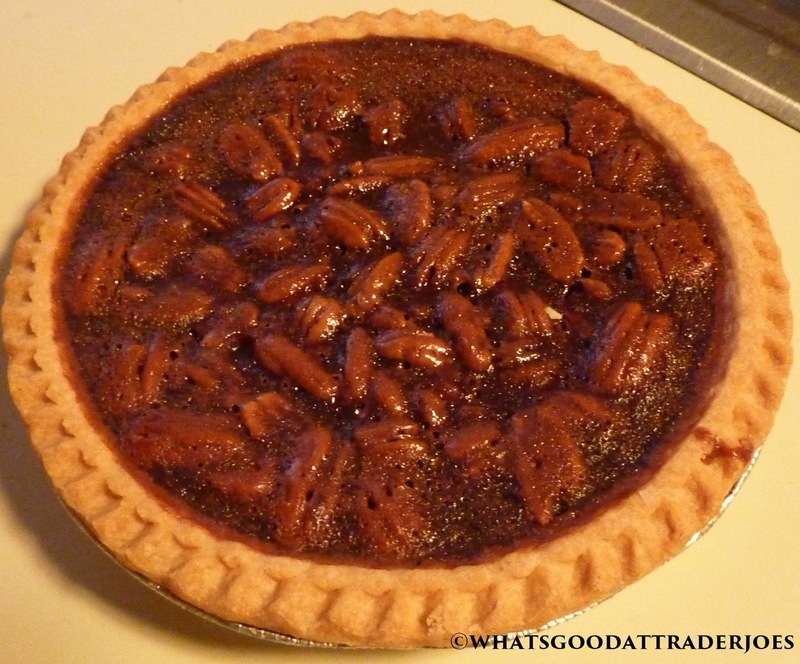 In my opinion, the benchmark for whether a pie like this is "too rich" or not would be whether you can taste the pecans or not. Well, you can taste the pecans in this instance. They blend seamlessly with the chocolate pudding in a way I wouldn't have expected to even be possible before trying this choice confection. The chocolate pudding is quite rich, to be fair. But Thanksgiving dessert is supposed to be rich. It's thick, sweet, creamy, and very chocolatey. It's not like they dumped a few cups of Jello pudding in this pie, either—this stuff is top-shelf...no disrespect to Bill Cosby...well, okay, I guess we've all lost a good bit of respect for Bill Cosby, but not because of his lifelong advocacy of Jello pudding and its derivative products. What I'm trying to say is that the pudding here is thick, fudgey, and among the best I've ever had. The crust is a typical pie crust—similar to any pre-packaged, store-bought pie you'd find this time of year. It's fresh, flaky, buttery, and delicious, but in a way, it's the only part of this pie that isn't mind-blowingly unique. Don't get me wrong, it's nothing to complain about. At all. And the pecans...man, don't get me started on the pecans. If you like pecans, there are about a million of them in there. And if you don't like pecans, there are still a million of them in there. So...that might be one reason not to buy this product. 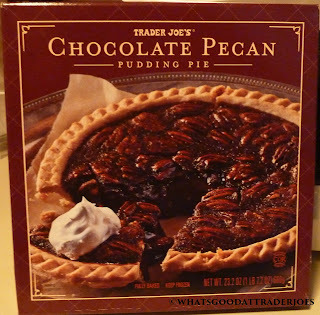 In my mind, this pie might be up there with cookie butter in terms of TJ's scrump-dilly-iciousness. Sonia's score will ensure this pie never sees the light of the Pantheon. My score will make sure it's remembered as better than simply "not bad." 3.5 from her. Perfect 5 from me. It's almost as good as cookie butter?? Sold. 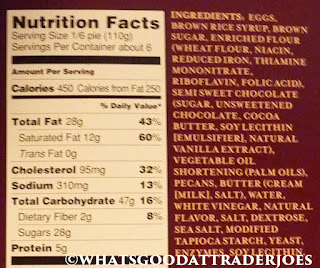 Could you try to include the allergen warning on your nutrition and ingredients pictures? I don't want to get my hopes up too high for this product as most nut products are processed with peanuts, but there's still a slight chance I could maybe get to eat this delicious looking concoction. 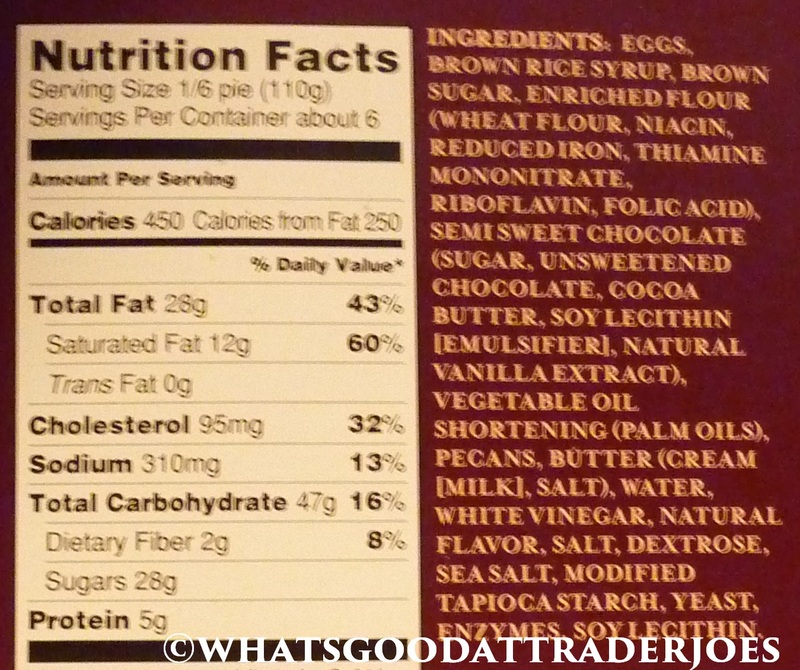 "Contains egg, wheat, milk, pecans, soy, may contain traces of coconut, almond." Is this in the frozen section? I do like this, sweet as it is. But did anyone notice the salty hit in/around the crust? It seems almost like a salted caramel. I don’t necessarily dislike that, but it seems to be unevenly applied or distributed. I would have loved to have tried this but every Trader Joes in Phoenix informed me that they are gone and done for the season. What season? The holiday season? Because that's JUST STARTED!